Hasbro acquired the rights to Avalon Hill in 1997 for six million dollars. 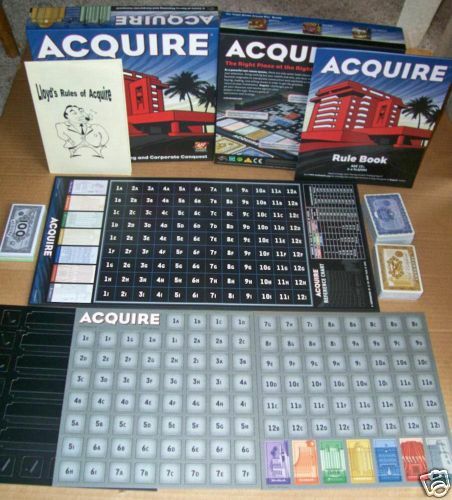 They proceeded to produce a version of ACQUIRE in 1999 that was visually stimulating. The big box version contained larger plastic tiles that were easy to handle and read. The instruction booklet was a major upgrade and professionally done. (Avalon Hill had been printing the rules on a single sheet of paper.) Yet the design of the stock certificates and the money did not match the upgrade afforded the rest of the game. Hasbro changed the hotels to corporations and updated the names. Sackson and Zeta were low-priced; Fusion, America and Hydra were medium-priced; and Phoenix and Quantum were high-priced. Corporation markers were three-dimensional, which was a nice touch. Hasbro provided a plastic holder for the stock certificates and the corporation markers during game play. The information cards are also enlarged for better viewing. This 1999 game commands the largest price today out of all the other versions of ACQUIRE except for the World Map edition. A used 1999 version of ACQUIRE will cost around $100, while a shrink-wrapped version will cost around $150. Hasbro has since passed the rights for ACQUIRE to their subsidiary, Wizards of the Coast. 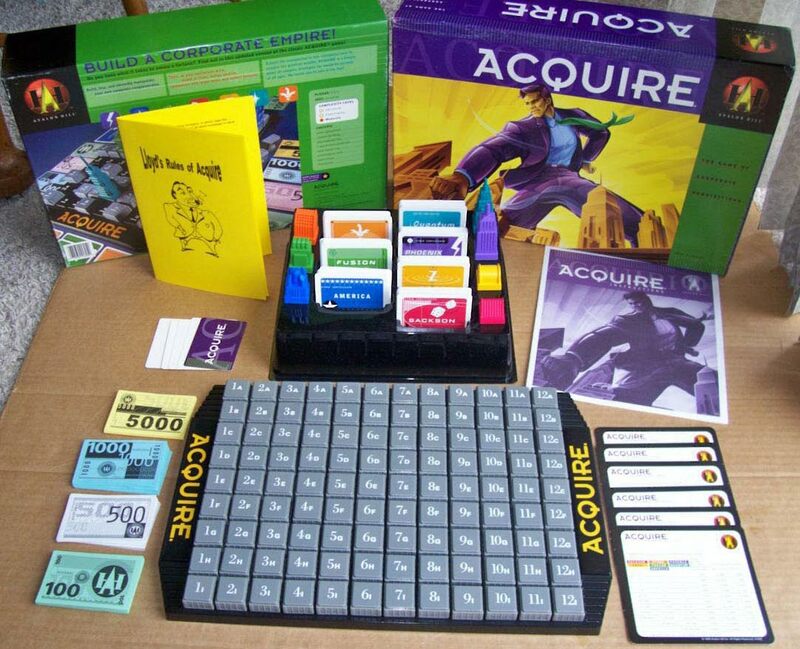 Wizards produced a version of ACQUIRE in 2008 that they considered the "50th Anniversary Edition." This edition was inexpensive. The pieces are made out of cardboard and even the information cards have to be cut out of the instruction booklet. They did, however, build an information card into the board along with designated places for the stock certificates. The only redeeming quality of this version was the design of the stock certificates. The hierarchy and the traditional colors of the hotel chains were also changed. Luxor was replaced by Sackson (for obvious reasons) and paired with Worldwide as the lower priced hotels. Festival, Imperial and American are the mid-priced hotels and Continental and Tower are the higher priced hotels. This version was a huge disappointment to a game that has acquired such a lengthy legacy. This version should be available for under $30 with shipping.